The ultimate in twin gift baskets! The cute stars & moon embroidery in this heavenly ensemble shine brightly in welcoming the two new special deliveries! 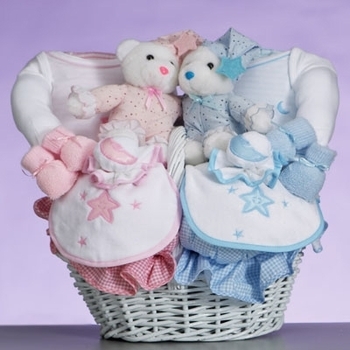 Everything in this basket is manufactured in America using only premium domestic cotton fabrics! Everything is artfully gift wrapped and ready for delivery! Free shipping included.